Note: A tartine is a hot, open-faced sandwich. This one is just as good cold. Chop onions into narrow slices and cook in butter at low heat about 7 minutes until they are golden brown. While onions are cooking, toast the bread. Drain onions and sprinkle liberally across the top of the cheese. 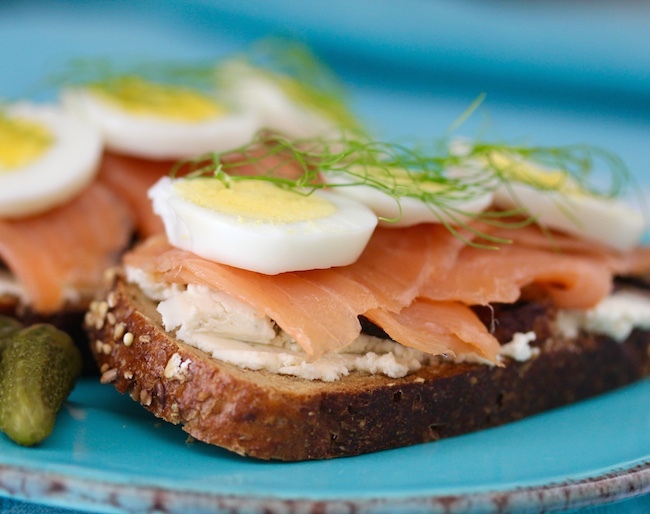 Layer smoked salmon and hard-boiled egg slices on top of salmon and garnish with fresh dill. For a hot sandwich, heat in microwave for 45 seconds before serving.